A new channel has started in DVB-S2 Clear: Syrian Drama TV (Syria) on 11592.00MHz, pol.V SR:5426 FEC:3/4 SID:1 PID:33/34 Arabic,35. A new channel has started in DVB-S Clear: Syrian Drama TV (Syria) on 11179.00MHz, pol.H SR:27500 FEC:5/6 SID:73 PID:3189/3289 Arabic. A new channel has started in DVB-S Clear: Syrian Drama TV (Syria) on 3964.00MHz, pol.R SR:27500 FEC:3/4 SID:1811 PID:2111/2211 Arabic. Syrian Drama TV is back on 3964.00MHz, pol.R SR:27500 FEC:3/4 SID:1811 after a break ( PID:2111/2211 Arabic - Clear). Syrian Drama TV is back on 12054.00MHz, pol.V SR:27500 FEC:3/4 SID:1811 after a break ( PID:2111/2211 Arabic - Clear). Syrian Drama TV is back on 11976.82MHz, pol.V SR:27500 FEC:3/4 SID:1811 after a break ( PID:2111/2211 Arabic - Clear). A new channel has started in DVB-S Clear: Syrian Drama TV (Syria) on 12729.00MHz, pol.H SR:27500 FEC:5/6 SID:608 PID:1608/2608 Arabic. New FEC for Syrian Drama TV on 10921.97MHz, pol.V: FEC:5/6 ( SR:27500 SID:2055 PID:75/76 Arabic - Clear). Syrian Drama TV switched to Eutelsat 3B satellite at 11511.00MHz, pol.V (DVB-S , 11511.00MHz, pol.V SR:27500 FEC:3/4 PID:75/76 Arabic). A new channel has started in DVB-S Clear: Syrian Drama TV (Syria) on 11511.00MHz, pol.V SR:27500 FEC:3/4 SID:2055 PID:75/76 Arabic. A new channel has started in DVB-S Clear: Syrian Drama TV (Syria) on 11054.00MHz, pol.H SR:22000 FEC:1/2 SID:4020 PID:1110/1031 Arabic. A new channel has started in DVB-S Clear: Syrian Drama TV (Syria) on 11137.00MHz, pol.H SR:22000 FEC:1/2 SID:7 PID:519/1287 Arabic. Syrian Drama TV switched to Eutelsat 7 West A satellite at 10911.00MHz, pol.V (DVB-S , 10911.00MHz, pol.V SR:27500 FEC:3/4 PID:75/76 Arabic). Syrian Drama TV (Syria) broadcasts in DVB-S Clear on 10873.00MHz, pol.V SR:27500 FEC:3/4 SID:8015 PID:1615/2615 Arabic. Syrian Drama TV (Syria) broadcasts in DVB-S Clear on 10873.00MHz, pol.V SR:27500 FEC:3/4 SID:8021 PID:1621/2621 Arabic. Syrian Drama TV is back on 10911.00MHz, pol.V SR:27500 FEC:3/4 SID:2055 after a break ( PID:75/76 Arabic - Clear). ADD: New frequency for Syrian Drama TV: 12015.00MHz, pol.H (DVB-S SR:27500 FEC:3/4 SID:481 PID:525/5644 Arabic- Clear). 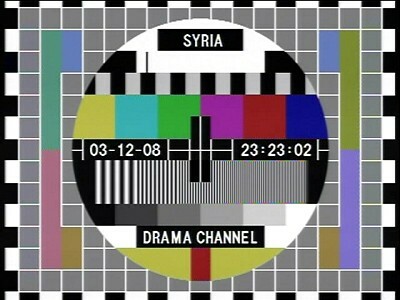 New frequency for Syrian Drama TV: 11409.00MHz, pol.H (DVB-S SR:27500 FEC:3/4 SID:2055 PID:75/76 Arabic- Clear). Syrian Drama TV (Syria) broadcasts in DVB-S Clear on 10911.00MHz, pol.V SR:27500 FEC:3/4 SID:2055 PID:75/76 Arabic. A new channel has started in DVB-S Clear: Syrian Drama TV (Syria) on 12245.00MHz, pol.H SR:27500 FEC:3/4 SID:102 PID:122/132 Arabic. A testcard identified Syrian Drama TV has started in Clear on 12054.00MHz, pol.V SR:27500 FEC:3/4 SID:1811 PID:2111/2211 Arabic.